In the tradition of Lyons – For the fainthearted . . . 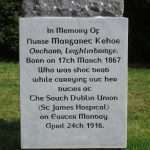 Visiting the Co Carlow village of Leighlinbridge on a bright August morning, a walk brought us to the sculpture garden, which includes a memorial to Nurse Margaret Kehoe. 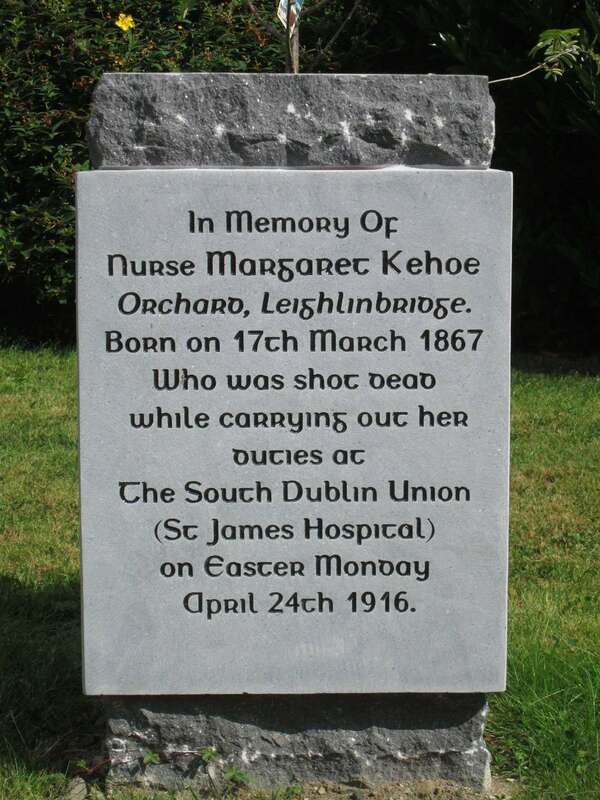 Nowhere in the Easter Rising commemorations do I recall the name of Nurse Kehoe being given any prominence, not even on a 1916 Centenary tour of Dublin was Margaret Kehoe considered significant. Why was a nurse shot dead in the course of her humanitarian duty not as worthy of remembrance as the men who died? Is it because she was a non-combatant? Or is it because she was a woman? “one of the best-loved figures in Dublin and a notable champion of all sorts of minority causes. He was a teetotaller, a vegetarian, a worker for women’s rights, a socialist, above all a pacifist”. Lyons’ choice of words leaves no doubt as to his own personal assessment of the role women played in the movement. Perhaps Lyons was at least honest, unlike those who now publicly pretend to be inclusive and hold an entire commemorative process in which the women who died are no more than a footnote. The South Union was the workhouse. What’s unclear is if she was a medical wardress in the workhouse or had some connection to the Volunteers. Given it would be rather unlikely a woman would be connected to the Sherwood Foresters and be that close to a skirmish. Duties, in this case is a loose term. Hanna Sheehy Skeffington would’ve been well known and regarded in the FF republican tradition and the Labour tradition, if a bit less. In TCD and UCD or FG perhaps not quite so much. Recent material seems to suggest that Nurse Kehoe was just a nurse doing her duties. Why her name was not recalled with more prominence does say something about the agenda of those who devised the 1916 Commemorations. Hanna Sheehy Skeffington was a disturbing figure for a conservative Roman Catholic hierarchy, as were women like Kathleen Lynn and Madeleine ffrench-Mullen.